backed by third-party, independent, medical research studies. In two randomized, independent medical research studies conducted by Dr. Paul Thomlinson (an external, third-party Ph.D. research scientist specializing in health care evaluation), patients who had received care at The Disc Institute® were studied to evaluate the effectiveness and long-term results of IntraDiscNutrosis® by The Disc Institute®. 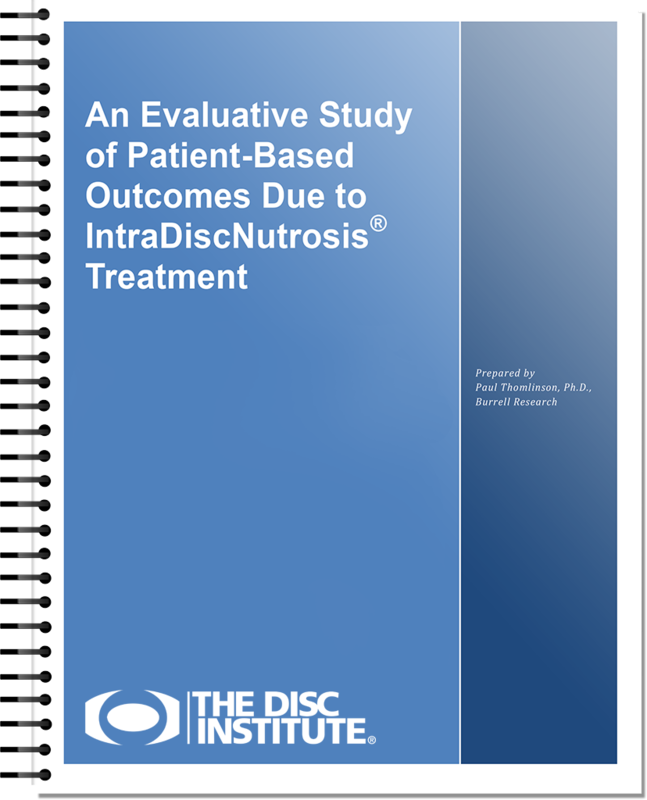 An analysis of typical patients receiving care at The Disc Institute® revealed that 98% reported clinically significant improvement, and even 3 years after treatment was completed, IntraDiscNutrosis® proved to have a 96% success rate. Both groups successfully avoided surgery. Click here to see the full, notarized statement by Dr. Paul Thomlinson. Why doesn’t our treatment work for 2% of the patients who come to us for help? Simple…everyone’s body responds differently to ANY form of medical treatment. It’s the reason that all drug manufacturers have to print POSSIBLE side effects of their drug on the label. It’s also why surgeons make you sign a legal disclaimer that in a SMALL PERCENTAGE of cases, things do go terribly wrong from spinal surgery. Different peoples’ bodies respond differently no matter what treatment is used. At The Disc Institute®, we would love to be able to get perfect results for 100% of our patients. That’s why we don’t accept every case, and work so hard on each case we do accept into our program. 98% of the patients we accept at The Disc Institute® respond and succeed in a predictable way to the treatment we have perfected, even though they previously failed with everything else they were recommended. And when a patient falls into the 2% who’s bodies don’t respond to our treatment program, we’re just as upset as they are…upset because we care deeply for every one of our patients and want to see them avoid surgery and get their life back on track. And the good news is that treatment at The Disc Institute® is 100% non-invasive, non-surgical, has no side effects and no downtime. So, even if a patient is in the 2% of people who don’t respond, our treatment program cannot hurt you, harm you or make you worse. It is important to understand that treatment at The Disc Institute® may not be appropriate for every situation. Call a Disc Institute® location near you today to see if you qualify for their innovate approach to disc repair.